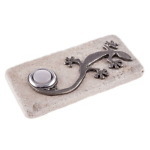 Made of solid stone travertine with a silver Gecko artfully wrapping around the lighted push button. Truly a unique touch to any entrance. Does NOT require screws due to the stone backing, but comes with glue required to adhere to any entrance. Add a custom design to your home with this gecko detailed lighted wired doorbell push buttons. Molded from travertine, this push button brings personality and a touch of whimsy to any entrance. 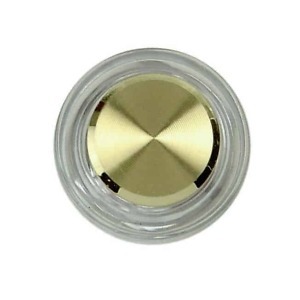 The button is lighted by an LED that will last a lifetime, and never get hot to the touch. Love the quality and attention to detail. Shipped on time and would purchase from them again. Product very well done, unusually nice workmanship. Price surprisingly low. Classy. Easy install. Grand-kids really like it. 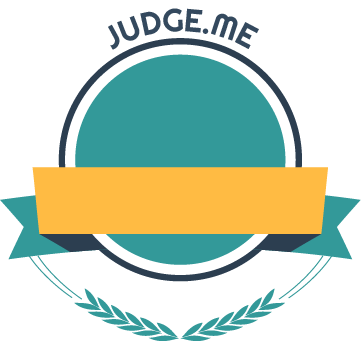 Good looking and great service, very prompt. You don't find these kind of doorbells in the home improvement stores! Great looking doorbell....just what we needed. Prompt service! This is the perfect addition to our xenoscape yard/ entry. We love this doorbell. Great customer service. Will certainly recommend this company.